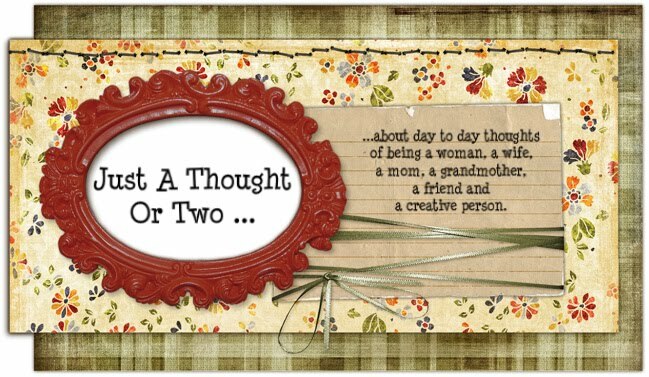 So Eileen suggested "favorites" for this blog hop. 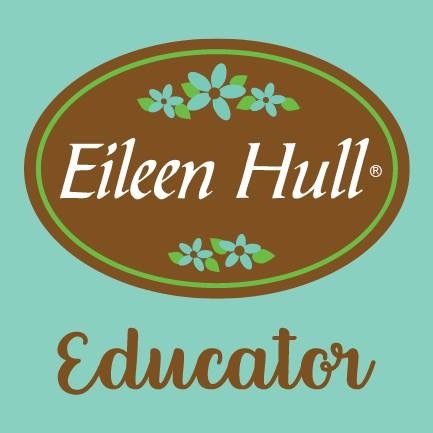 With that being said, I gathered several of my favorite things to create this latest project using another of Eileen Hull's ScoreBoard dies by Sizzix. With the summer season approaching and three holidays (Memorial Day, Fourth of July, Labor Day), were we celebrate the "Red, White & Blue", my color choice was easy. Next decision was, should I do the obvious and "make a cake" or turn out something else? My search began for materials to use. Once the colors were decided on, the first step was to go find fabric in my stash. Then I rummaged through my drawer of lace, ribbons and trims for more ideas. Dumped out the jars of buttons to find the right ones for embellishments. Pulled out some remnants of felt to use where I could. So I gathered several of my favorite things. With everything sitting on my work table, ideas for the little jewelry box began to develop. 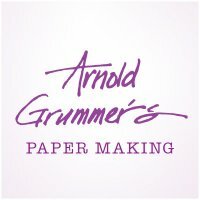 I cut three extra circles from heavy cardstock, the same size of the base, to use on the cover and the bottom. Each circle was covered with fabric and glued to the top cover and inside, as well as the bottom. Fabric covered the outside of the cake. White felt lined the inside, with a circle of blue felt at the bottom. Red ribbon strips, as well as tiny vintage rick-rack was added for trim. 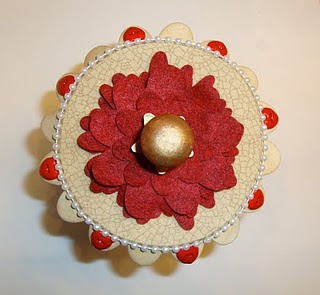 Red heart buttons, pearl trim and a flower, die-cut from red felt, is layered on the top. Wooden drawer pulls and a star shape were stained and added as feet on the bottom and a knob on top. Eileen Hull said .... Madeline, these are some of my favorite colors too being from a military family. JGoode said .... 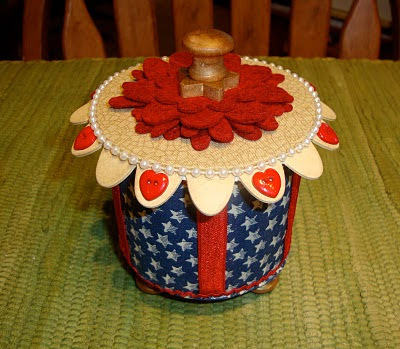 Fantastic job - I love the patriotic theme.. and the lid is absolutely wonderful idea. great idea! I love boxes and yours is so cute! so pretty! 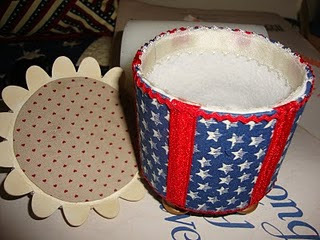 I love the vintage 4th of July embellishments! it would a perfect table decoration!